24V Standard Run External Battery Pack Module for standard runtime applications for the Smart models: 1250XL NET, 2200NET, 2200XL NET, 3000NET, 2200RM, 2200RMXL, and 3000RM Rackmount models UPS Systems. 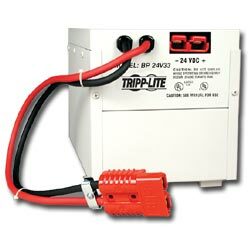 Rating of 33 amp-hours at 24-volts DC, daisy chainable, and comes with connecting cable. Rugged all metal battery enclosure safely houses UPS batteries and includes heavy gauge cabling with pre-installed DC connectors for simple installation.